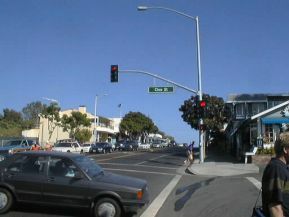 From Broadway turn left heading east on PCH. Cleo street is about a quarter of a mile down PCH. Cleo street is not too difficult to find because there is a traffic light at Cleo street. The picture above shows Cleo street and the building that you should look for to mark the right turn onto the street. You will be making a right hand turn onto Cleo street so make sure that you give yourself an opportunity to get into the right hand lane on Coast highway. Parking at Cleo Street Beach is very limited as is seen in the picture. In fact there aren't more than just couple of parking places on the street. There are parking meters to pay, you feed them 1 quarter for each 15 minutes and there is a two hour limit before you are supposed to move your car. Please don't park in the alley or someone's driveway though, the Laguna Beach parking enforcement is one of the fastest and most efficient that I have ever seen. If you park in someone's driveway or you don't keep the meter fed and your car moved you will get a ticket. 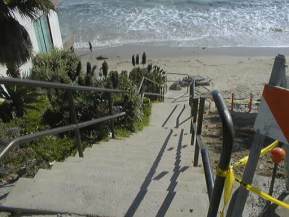 Beach Access at Cleo Street Beach is via a long steep staircase that leads to a landing. You turn to your right and follow a path past a pump house then turn to the left. 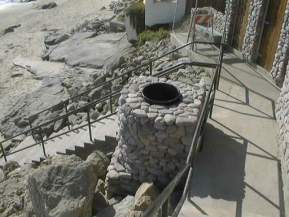 From there you go down another staircase to the sand. The stairs are steep and not very wide. Use extreme caution when navigating the stairs with scuba gear on. The beach area is not very wide at Cleo Street and at high tide the beach area gets completely covered with water. Facilities at Cleo Street Beach are very limited! In fact the only thing that you could call a facility was the trash can pictured here. Above at the parking area there are fast food restaurants though. 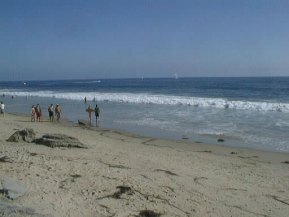 There are no exposed reefs for diving at Cleo Street Beach. However If you follow almost straight out from the stairs at a bearing of 230 degrees for 150 to 200 yards there is the wreckage of the Foss 125, also known as the Cleo Street Barge. The Foss 125 is in 45 to 60 feet of water and is over 60 feet long and about 20 feet wide. Remember that this is wreckage, be careful!